I spent a half an hour checking my SolCal stores for the new Monster Cuba-Lima Energy drink. No luck yet, but it is coming! It’s here, read my review below. Monster’s line of energy drinks has grown extensively over the last 5 years with Cuba Lima becoming its 30th beverage on the market. From what I can tell, this new energy drink is a non-alcoholic drink based on the mixed drink, the Cuba-Libre. The alcohol has been replaced with Monster’s energy blend. Squeeze a lime into a Collins glass, add 2 or 3 ice cubes, and pour in the rum (we like the golden type and really like a darker, more flavorful riserva). Drop in one of the spent lime shells and fill with cold Coca-Cola. Stir briefly. src. So to put it simply. It looks like a rum and coke with lime. The first thing that caught my attention with Cuba-Lima was the texture of the can. It has bumps that give the appearance that the can is sweating even when it’s not. Cool, right? I love lime and I love cola, but when I tried Coke with Lime, I wasn’t impressed. Therefore, my expectations here weren’t very high. In any event, this Monster is tasty with the right amount of sweetness. There’s no rum flavor in this mocktail and I couldn’t taste the energy ingredients. No real surprises here. Some carbonated water, sugar, cola and lime flavor, monster energy blend, and some Sucralose along with artificial ingredients. I did detect a slightly salty taste, and sure enough, salt is listed in the ingredients putting the sodium content of Cuba Lima high at 340mg per can. No mention of salt in the cocktail recipe, but it sure works for margaritas! You know how much a regular can of Monster peps you up? Well, Cuba-Lima is the same. 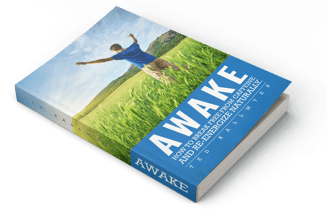 160mg of caffeine included in the standard 5000mg energy blend, ginseng, and B vitamins in a 16 fl. oz. can. I replaced my second cup of coffee with Lima and it definitely gave me more energy than that second cup, but partly because of the 48 grams of sugar I consumed. My coffee has 0 grams. 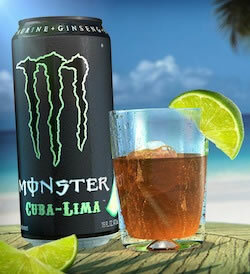 No doubt, Monster Cuba-Lima will be a hit with energy drink fans. It has a great flavor combination that’s unique in the energy drink market as well as Monster’s signature energy blend.